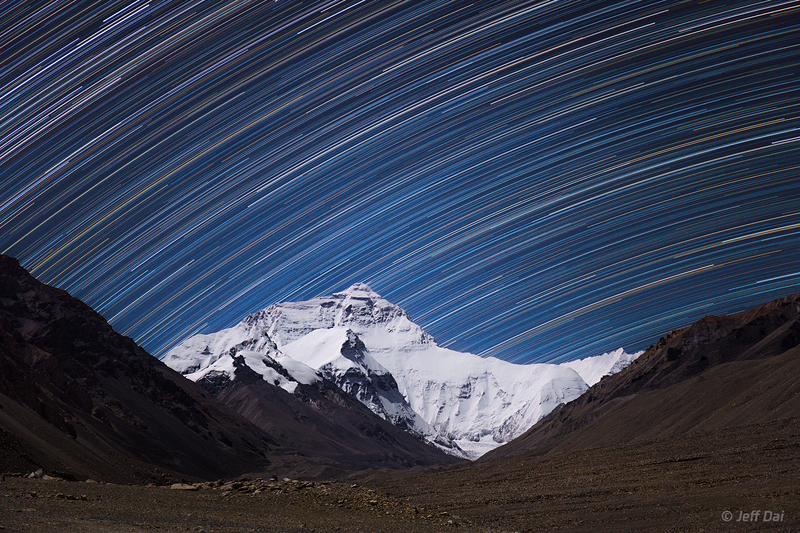 The highest peak on planet Earth is framed in this mountain and night skyscape. On September 30, the digital stack of 240 sequential exposures made with a camera fixed to a tripod at an Everest Base Camp captured the sheer north face of the Himalayan mountain and foreground illuminated by bright moonlight. Taken over 1.5 hours, the sequence also recorded colorful star trails. Reflecting the planet’s daily rotation on its axis, their motion is along gentle concentric arcs centered on the south celestial pole, a point well below the rugged horizon. The color of the trails actually indicates the temperatures of the stars. Blueish hues are from hotter stars, and yellow to reddish hues are from stars cooler than the Sun.